Happy new year everyone! How was your 2015? I’ve been busy, both personally and professionally. Family Thesis Whisperer renovated a house and moved into it, putting down proper Canberra roots. I lost my ‘baby weight’ (Thesis Whisperer Jnr is now taller than me so it was way past time) and started running. The blog went from strength to strength and a significant research project got off the ground (more on that in forthcoming posts). With a fantastic team at ANU, I ran a MOOC with 13,500 enrolments and over 800 people attended the ANU 3MT competition. Thanks to your help dear reader, I got promoted to associate professor. I raised a glass on new years eve with a sense of multiple jobs well done and dusted. One of the small, but significant, achievements for me in 2015 was becoming a much more tidy person at home. For years Mr Thesis Whisperer has complained about picking up after me, but ever since my friend Megan McPherson recommended the bestselling book by Marie Kondo called ‘The life changing magic of tidying up’ he’s had no need to complain. Megan was way ahead of the hype curve on the Marie Kondo tidying craze. I had never heard of the Japanese clutter busting guru when she enthused about it, but it was cheap in Kindle and I trust Megan’s taste, so I bought it. I read The Life Changing Magic of Tidying Up greedily, in one sitting, like it was a box of chocolates. If you haven’t read it and are put off by the hype, don’t be. It’s a fun and engaging book: part self help and memoir, part philosophy and a light read for those of us accustomed to dense texts full of academic jargon. The so called ‘Konmari method’ is disarmingly simple: only keep possessions which bring you joy. I started Konmari-ing with clothes, sorting first by category. I took every top out of my closet and held each one in turn and asking: ‘does this top bring me joy?’. To my surprise, I got rid of most of them. Konmari-ing is a surprisingly intense process that, of course, only the truly privileged will ever experience. I was forced to come face my conspicuous consumption and it wasn’t pretty. Luckily Canberra has the fantastic Green Shed initiative, so I was able to donate to others, rather than landfill. I ended up keeping only about 1/4 of my wardrobe. Less choice about what to wear made my mornings easier. I spent less time getting ready, which meant I had far more time drinking coffee and reading the Interwebs. I was hooked and started Discarding with gay abandon. Most of my jewelry box, knick knacks, and books were soon gone. Mr Thesis Whisperer was so impressed with the results he joined in the Great Kitchen Purge of 2015. Part of the Konmari method is to have a designated place for everything you keep, so we had long, intense discussions about where to keep the kitchen scales and serving platters. Gradually the pantry and fridge were transformed from crowded places where sauce bottles go to die to efficient, clean storage zones. Friends started remarking on how scary tidy our place had become. Unlike other life changes I have attempted, the Konmari way seemed to stick. I started more carefully considering new purchases by measuring them against my personal ‘joy index’. As a consequence I bought much less and started treating what I have with much more care and respect. As promised by Ms Kondo, tidying now feels like a natural process, not a chore. I actually enjoy folding all my stockings and socks into my drawers. I started to wonder – might the Konmari method work to bring a sense of peace, control and order to my work life too? I am very ‘other motivated’ in my work. The various reports and deliverables that go with my role as director of research training are done well in advance because other people are expecting them. My teaching is very organised thanks to proper training and business processes I have honed carefully over the years. My blog schedule is sorted out a year in advance because you, dear reader, expect to see something every Wednesday and I don’t want to disappoint you. But my research work? Always in a shambles. Unlike the rest of my work duties, my research schedule is largely set for me, by me, therefore it’s a mess. I get research outputs done, but I still rely on others for motivation. As a consequence I haven’t published a solo authored paper since 2011. Unless I am collaborating or writing a book for a publishing deadline, I will always find something else to do with my time. The reading problem is even worse than the writing problem. Reading is just not a priority, but it is a source of constant anxiety. I never feel like I do enough of it, or have enough time to properly digest what I do read. One of my students, Jodie, calls this feeling of constantly being in a reading deficit ‘readitis’: a disorder bought on by the vast amount of literature available and the limited time in which to absorb it. I’ve started to think about how Konmari methods might be applied to this readitis problem. My first step was to pick a soft target. Like many academics, I’m a bit of a pack rat and download far more papers than I will ever read. My ‘research closet’ – my reference database held in Papers 3 – had ballooned out to over 2000 references. In late November I spent a couple of hours every evening opening each paper, thinking about why I had it and how it fitted into my various research interests. Unless there was a reason to keep it for a future project, the paper was immediately deleted. In the first pass I discarded all but two of the 600 or so papers I collected for my PhD and many others. Those papers had clearly served their purpose, but I still had around 1000 papers left – more than I would ever read or need. The problem of these remaining references was, I realised, similar to the problem of Konbari-ing my underwear. I had plenty of good, serviceable underwear and the temptation was to keep it for future need when the others wore out, but it was taking up a lot of space. So I bought baskets that fitted into my drawers sized to hold two week’s supply – the longest possible time between washing loads. Then I simply put the best underwear in the baskets and threw the rest out. I ended up with a hundreds and hundreds of papers which didn’t fit clearly into to any of these collections. It caused me a bit of a pang to press delete on these, but I did it. Now I have only 681 papers in my database. This is still around half a million words – more than I need – but I’m feeling more in control. This is not a cure for Readitis – perhaps more in the nature of a treatment. For me, choosing what to read is not so overwhelming and that’s a good start. My collections set useful boundaries and help me start on the reading with a sense of purpose. This process of discarding research material might not be for everyone. I tweeted about it as I did it and many academics expressed horror at the prospect of throwing so many papers into the virtual bonfire. Other people told me they are applying the Konmari ‘less is more’ philosophy to data or to notes – even to supervisors! So I’m wondering – have you thought about how discarding might help your research get off to a good start in 2016? I’d be interested to hear your thoughts in the comments. « So long – just for summer! Happily, I’m in that new year, organizing mood (though haven’t read Konbari yet), so while it lasts I might follow your example and press delete on those articles that I’m pretty certain will not ‘come in useful’ as I must have thought way back when I downloaded them. Still not sure what I’m going to do about the Twitter problem though! Also – Congratulations on your promotion! Thank you very much 🙂 Yes, the Twitter deluge… must blog about that one day! I bought Ms Kondo’s book to mark the New Year with a thorough tidy up. And, although I was a bit embarrassed about reading it, I have been amazed at the difference her ideas and folding techniques have made in our tiny Manhattan apartment. I am now working towards a really pleasing organisation of my ‘stuff’. (I have been thinking of Daniel Miller’s writings on material culture throughout the process.) Having sorted my closet and my bookcases, it is time to move onto the piles of papers under my desk, and eventually the many folders of reading hidden on my laptop and kindle. Thanks for the suggestions as to how to manage this! I love that Daniel Miller book too – had not thought about the connection before. So jealous of the opportunity to meet the Tidy Goddess. If you go, please tell us what she was like! ah – indeed. Thank you. Not sure how that one crept through the editing process. I blame the holidays! Something that helps lessen the pain of removing dozens or hundreds of articles from your reading list is to trust in the fact that if something really is important to your research, you will discover it again. I also use this idea with articles that come up on social media. Where I used to save everything of any interest at all to a read-it-later app, now I’m much more critical about what I save. For stuff that I’m not sure about, I tell myself that I’ll see it again (retweeted, linked to, shared, liked) if it has anything important to say. Even better is the “Listen (TTS)” function, which allows me to ‘read’ the things I’ve saved while I walk the dogs! 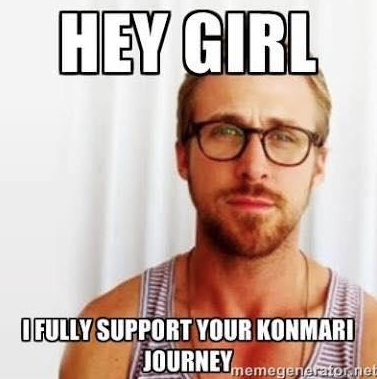 I love her and I feel that a KonMari venture IS actually in line with my PhD research! I can happily read her books and put her ideas into practice and call it ‘research’ … I’m focusing on Hoarding Disorder! Thanks and btw I love your posts. Well done on your year, Thesis Whisperer! And thank you for the link to the article about Kondo’s book. The basic idea ‘does it bring joy?’ is very powerful. In her excellent “The Zen Leader” (2012, https://books.google.com.au/books?id=vOj2ygAACAAJ) Ginny Whitelaw recommends we — all of us! — simply stop doing anything that does not bring joy, because continuing will create problems. Seriously trying to apply this principle is a very interesting ride. Applying the ‘joy’ principle to objects whose affect comes from their *content* — virtual and physical texts, and incoming information streams — is perhaps more complicated. Or is it? What do people think? I am currently reading for a literature review as part of my PhD project and am feeling rather overwhelmed by the amount of reading. Would it be possible to do a literature review writing about only the literature that brings one joy? Or might one evaluate the literature on that basis? but it does make a bit of sense to use the literature that you have found joy (joy as engagement). There could be different types of joy. useful joy, pleasure joy, joyful joy. I am also reading for my thesis literature review and have spent a few hours reading what I found joyful about my research. It was worth it – it energized my work in a new way. I recommend a joyful meander on occasion during this process. Well, and yoga has gone a long way toward preserving my spirit. Glad to have you back Thesis Whisperer. Congratulations on so many achievements in 2015! I also save way too more articles than I could ever read and no doubt many more than I need to read. Although, as an early stage PhD scholar, I find it hard to convince myself that I don’t need to read everything that touches on my area of research. From my perspective culling my article archives takes second place to actually reading some of the more relevant ones. At the beginning of this year I came across a great suggestion from Jeffrey Keefer on his blog Silence and Voice of reading #5Papers a week and tweeting about them. What I like about this approach is that there is a level of accountability involved, although I am blogging rather than tweeting my summary and reflections on each paper I read. Previously I would read a lot, either in-depth or skimming, but I wasn’t very disciplined about recording what I read and I had multiple methods for taking notes when I did them. I’d often remember that I’d read something relevant but not be able to remember where. Jeffrey proposes a simple seven point summary of each article which helps focus my reading on key questions book ended by reflections on why I’m reading this article and what I learnt from it. At the moment a handful of people have started doing #5Papers and sharing their summaries. I’d love to see it used by more. It provides a nice counterpoint to the well established focus on academic writing, as well as a helpful discipline and a fairly manageable number of articles to read each week. Yes! Loved this post! I have been adopting the mantra of “less is more” with material things. This past weekend, I actually got rid of about 100 journal articles I had used a while ago. I really like that app: Papers. I will check it out. Thanks for sharing. Great perspective! Also, congratulations on your promotion! Happy New Year! I always look forward to your post. I can relate to having readitis. This post made me realize I need to go through my papers as well. I read Marie Kondo’s book during the summer and it was a good resource for getting things I’m order. Congratulations on your promotion and thanks for this post on Konmari. I will try to give it a try soon. 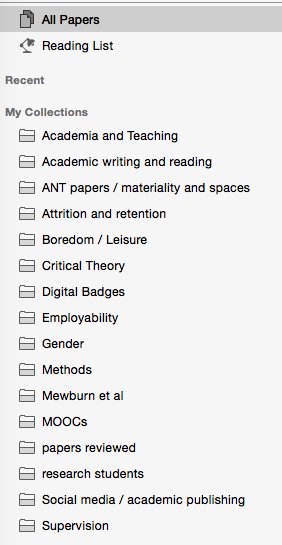 Well I am pleased/relieved that I am not the only academic hoarder out there! I have occasional bouts of reading guilt too, but mostly I’ve made peace with downloading articles I don’t get to right away. I’ve used Mendeley for about five years now and have almost 3,000 articles at my fingertips, and found that I sort of reached a critical mass at which point it became a useful data base in its own right, fine tuned to my research interests. It is a great starting point when I’m going back to a topic/tag I haven’t thought about for a while. For me at least, tagging and broad topic files organize me without taking up too much time.